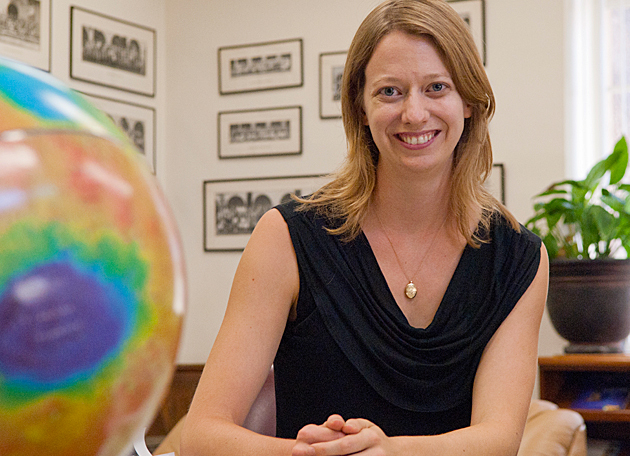 Dr. Bethany Ehlmann has a joint position as an assistant professor of planetary science at the California Institute of Technology and as a research scientist at the Jet Propulsion Laboratory, both in Pasadena, CA. Bethany has a Ph.D. and M.S. in Geological Sciences from Brown University, an M.S. in both Geography and Environmental Change and Management from the University of Oxford (where she was a Rhodes Scholar), and a B.A. in both Earth and Planetary Sciences and Environmental Studies from Washington University in St. Louis. Before obtaining her current position at Caltech/JPL, Bethany was a Marie Curie Fellow at the Institut d’Astrophysique Spatiale in Paris. Bethany’s research interests are in environmental change, remote analysis of rocks and soils on planetary surfaces, and space policy. She is particularly interested in the geologic history of Mars and the causes of environmental change on that planet. Kat Gardner-Vandy, a postdoctoral fellow at the Smithsonian Institution’s National Museum of Natural History, interviewed Bethany for the 51+ Women in Planetary Science series over the phone. Congratulations on your new position at Caltech and JPL! Tell us more about it and how you came to have the job. Thank you! I started as a tenure-track assistant professor at Caltech with a joint appointment as a research scientist at JPL in late August 2011. We’re at the 1.5 year mark! I’m enjoying it so far. It’s a bit of an experiment, since they don’t usually do a joint appointment at the junior level. Twenty percent of my time is at JPL, and as a tenure-track assistant professor, I can’t do much more than that because of my responsibilities as a professor. In some ways, it’s really a dream set-up because I’m situated in the academic environment to teach and do research with students and colleagues and then can jump right on the freeway and have access to engineers at JPL. I’m starting the process now of doing projects at JPL involving instruments that are still in development and getting involved in some projects before they are on the spacecraft. The joint appointment was a tremendous plus for this job, as was the history of planetary science involvement over at JPL, but Caltech on its own has an outstanding geology faculty. It was important to me to be situated within a geology department that worked not only on other planets but on Earth as well. So far, I teach remote sensing and planetary surface processes, and eventually I may teach or team-teach an intro to planetary science course. You have participated in many programs and been to many places in such a short time. From undergraduate research, to the Rhodes Scholar program in the UK, to graduate school at Brown, to Paris, and now to Pasadena. What is your motivation in your scientific journey? I’m looking for the most intriguing scientific problems located within an awesome group of colleagues and mentors. Searching for that combination has been important in my career. I came to that realization early on in my undergraduate career, when Ray Arvidson at WashU introduced me to planetary science and got me involved with the Mars Exploration Rover mission when I was a senior undergrad. The mission experience got me hooked on planetary science, but I’m extremely interested in environmental science and science policy. So, I went to Oxford to study these but then decided to go back to the science side. My second year at Oxford, I did science research in geomorphology and rock weathering and, having been bitten by the planetary science bug, decided to go back to the US for a PhD. I headed to Brown to work with Jack Mustard. I knew exciting data from CRISM was going to be coming back, and I wanted to be a part of that. The idea of unraveling the new mineral story coming from Mars, with the things that had been found from OMEGA, was exciting to me. For me, it’s always been a bit of a back and forth, because I do love public policy and thinking through the implications of the science and how society should operate and organize ourselves. But ultimately, it came down to me enjoying the process of exploring and the challenge of creating new knowledge. I decided that I could do things in the policy world with my scientist hat on. I decided I’d rather be sitting on the advisory board than helping to steer them from my policy desk job. Day-to-day, I want to follow my curiosity; later I can pursue my policy interest as a scientist. The moving and travel hasn’t always been easy, but I wouldn’t trade the Rhodes/Oxford experience for anything; it was a singularly amazing part of my life. Likewise, I worked in Paris with the team who put up the OMEGA instrument on the Mars Express spacecraft. Something that has been special in my career has been my crossing of international borders across the Atlantic, and that has been tremendously enriching: to have both international and US colleagues. Well, I love both environmental science and space exploration, and early Martian history is an area where these interests unite. The study of environmental change of potentially-habitable places on Mars through time is a guiding theme in my research right now. I’ve done a lot of work with CRISM on detection of clay minerals, sulfates, and carbonate minerals, coupling these with stratigraphy trying to figure out what the environments were and why they changed. We’ve got the first billion years of the history preserved on Mars better than on Earth. What is your role with the Mars Science Laboratory (MSL) mission? On MSL, I’m a participating scientist, and as part of that, I focus on how Curiosity will recognize evidence of aqueous alteration as it roves. To do that, I am working across payload elements but mostly with the ChemCam instrument. The LIBS instrument shoots a laser at a rock or soil and uses emission lines from the ablated plasma to get the elemental composition from a distance up to about 7 meters or so away. My role has been both on the science side and operations side. On the science side, I’m working in the laboratory to help the ChemCam team improve the library that is used to get quantitative data, going from laser-induced emission spectra to actual quantitative geochemical estimates. We are focusing on alteration products and doing work in the laboratory on the ChemCam-like system at Los Alamos. On the operation side, it’s been a pretty exciting run because I’ve been part of the team doing science operations since landing. On any given day, we rotate who’s leading the geology and mineralogy theme groups who are designing activities for the next day, and I work as a member of both the ChemCam instrument team and broader science team on day-to-day rover operations. Wow, you have a lot on your plate! How do you juggle being at both Caltech and JPL? It’s very busy, especially with juggling the assistant professor thing. I try to stick to a regular schedule and stay in one place (JPL or Caltech) for most of each day for sanity’s sake! For the first few months of rover operations, it was a totally different beast. We were living on Mars’ time. I was mostly at JPL, and Caltech was getting second shift. Whether that was after Mars shift or before Mars shift was dependent on how the Mars day fell relative to the Earth day. Exhausting! How do you keep yourself organized and stay focused? I’m still working on it! It’s a work in progress. Something that I’m learning in the assistant professor job is that more opportunities flow your way, and you have to be more selective than you were as a graduate student and postdoc. Occasionally, you have to say no to things in order to maintain balance. Developing a judgment for what to say yes to and no to is something I’m learning through time. But it’s also about prioritization. For me, it’s responsibilities for mentoring my students and teaching classes that comes first, and making sure that research is moving along as well is an incredibly high priority. It’s fitting everything else in the interstices that remains difficult. You mentioned mentorship playing an important role in your early career. What other advice do you have for younger students besides finding and keeping mentors? What’s worked for me is really thinking deeply about what types of science and what problems excite me, but also what types of opportunities I want. Mission opportunities don’t always come up, so be strategic about where you go and how you find your next steps if you want to be a part of these. But I really think the key is finding a place where the people around you are supportive in the process of doing science. It is so much more enriching, so much more fun and you are so much more creative when you are surrounded by people who are supportive of you as a young scientist. I encourage folks to think about the science questions but also to really think deeply about what kinds of environments and people will be best and most supportive. It is so important to pay attention to the people who you are surrounding yourself with as your progress through various points in your career. That’s what’s worked for me! I love anything outdoors. I like hiking, skiing, and playing lots of sports like Ultimate Frisbee. I’m on the departmental softball team. I like good food, good wine, and travel. I travel a lot for work and still enjoy it for fun! Wonderful! Thank you so much for your time and insight, Bethany! Dr. Bethany Ehlmann, I have a comment. Some years ago, I read a book called “Hellhole of Creation” about The Danakil Depression in East Africa. I remember a number of references to Basalt rock in the depression which is 380+ feet below sea level. It seems to me that it would an ideal place to explore. In 1955 I was only able to go to the edge of the depression. But I have read since then that exploration is easier now. Making sure that my female students see the beauty, challenge, and fun in science and technology! Congrats Bethany! I’m also and Engineering grad from Wash U and worked with Ray Arvidson. Now a spacecraft/satellite system designer and CAD specialist – all thanks to Dr. Arvidson. Best of luck to you. If I’d known more about JPL, it would have been on my list of great places to work. Have fun. I’m a science fiction writer and need to ask someone about planetary science, specifically regarding magnetospheres and atmospheres. When I looked on major science sites, such as NASA’s dot-gov site, question sections were more geared toward children than adults, and it was impossible to find any contact information for the individuals I looked up from different documentaries I watched. What’s the best way to find a reliable, knowledgeable contact about different scientific topics, such as planetary science, whom I could occasionally call or email to clarify points? And perhaps even interview for my blogs? I’m not sure I have terribly useful advice on finding contacts: I suspect the reason you are having trouble finding contact information for scientists in documentaries is that they are reluctant to make that information easy to find (imagine all those in the audience who might want to email and ask questions). You might see if there is a planetary scientist at a university close to you (faculty email addresses are often available on department webpages): if that person is willing, you might be able to meet in person to help develop a connection. I would also suggest following some planetary scientists on Twitter – there are a number of us who post somewhat regularly. While it will be much less personal, you may also tap into a wider range of expertise… where most of us could give you the “planetary astronomy 101” answers to questions about atmospheres/magnetospheres, you might find an expert who is willing to help. To start finding some scientists to follow, try searching the hashtag #LPSC2013 – the Lunar and Planetary Science Conference starts on Sunday (Mar 17, 2013), and there will be multiple “microbloggers” tweeting updates from the conference. Thank you, that is very helpful! Hi Emily, just a quick thought, Emily Lakdawalla from the Planetary Society is interested in setting up some kind of contact list exactly for questions like this. It is just in the idea stages at the moment but you might contact her with your question above :). The way I find contact information for experts for whom Google searches don’t turn up info is to look up their work in the ADS abstract database: http://adsabs.harvard.edu/ . If the person is the first author on a paper, they will be listed as the “corresponding author” for the paper and usually an email address will be provided.